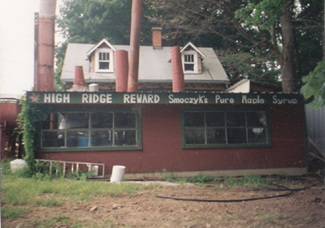 The property was purchased in November of 1982, and in the spring of 1983 while visiting with a brother in-law, the subject of making maple syrup came up. As Bill surveyed the forest that day he realized he had a large number of maple trees and thought it might be interesting to try his hand at making some syrup. After all, he was laid off from his construction job for a while yet and needed something to do. So Bill, and his wife Lisa, cut some sumac limbs and bored them through, found a hand drill in the shed, grabbed some pails and headed to the woods. They tapped 50 trees that day, little realizing as they hung the pails on the taps that they'd be hooked for life. They found an old cast iron pot, set it on some bricks and cooked sap into syrup. 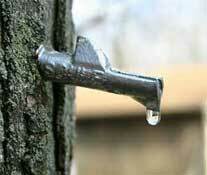 There was no hydrometer; Bill learned to see syrup by the drip test; if it hung in a sheet off the spoon it was syrup. We didn't make much syrup that first spring, but we sure made a lot of memories. We could hardly wait for the next spring to arrive, but wait we would have to, as Bill's job would take them to Florida until the following summer. 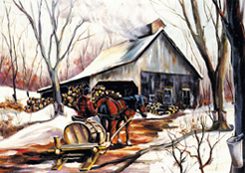 Maple fever began in earnest in the spring of 1985! Lisa's dad had made syrup as a boy and offered his advice and help. It was pretty rustic as Bill dug out a trench in the middle of a stand of maples, laid some brick on the side, dug a hole, and stuck a stove pipe in it. He then laid on top of the brick a 3/6 ft 3 sectioned flat pan, placed wood under the pan and lit the fire. Pretty rustic, but we did by this time have some nylon taps to use, and bigger buckets! 1987 saw even more improvements. Bill built an arch and had a 4/8 flat pan built. The fresh sap pushed the more concentrated sap ahead through the sections and the finished product was drawn off at the opposite end. We even had a hydrometer by then, and a powered tapper! Through the years there were many changes, many new friends, much syrup, 10 children, and many memories made. Tubing was added in 1989. We had a very knowledgeable neighbor who had been making syrup since he was "knee high to a grasshopper". George Starck was more than willing to share his know how with us fledging producers. The Roth's of Cadott also added their years of experience and well-stocked supply store to help as we went along.